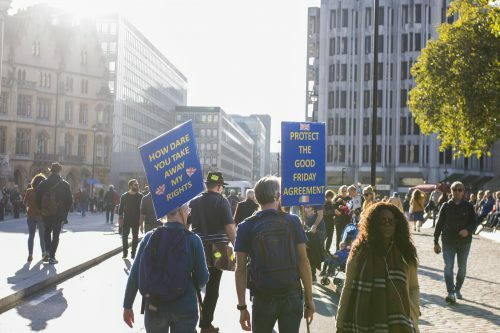 "Home Office ‘flouting’ the Good Friday Agreement"
Irish citizens in the UK face a potential Windrush-type loss of their rights unless the protections and commitments made in the Good Friday Agreement and the Common Travel Area are written into law, human rights lawyers have warned. The Home Office, where officials pursuing Theresa May’s ‘hostile environment’ for immigrants wrongly and illegally stripped several Windrush-era British citizens of their rights to healthcare or residency and deported them, is insisting that anyone born in Northern Ireland is exclusively British. MPs have also voiced their concerns that the Home Office is willfully flouting the 1998 Good Friday Agreement. The weaknesses and vulnerabilities have been highlighted by the Home Office’s continued refusal to recognise the right of Emma de Souza, from Northern Ireland, to be an Irish citizen despite explicit commitments in the 1998 Good Friday Agreement that all people in Northern Ireland may identify as Irish, British, or both. Colin Harvey, a professor of Human Rights in Queens University Belfast, speaking about the Emma de Souza case, told the Irish World that MPs and peers pay “lip-service” to upholding the Good Friday Agreement but do not apply it in practice. Ms de Souza, 31, is embroiled in a lengthy legal battle with the Home Office which argues that she – and others, whose cases have not yet been made public – cannot exclusively identify as Irish, seemingly contravening birthright provisions resulting from the Good Friday Agreement. Tory MP Maria Caulfield, who sits on the Northern Ireland Select Affairs Committee, said that she was “extremely concerned that the Good Friday Agreement is not being upheld” in the de Souza case and said that her committee may need to scrutinise the growing concerns. “The Good Friday Agreement makes clear that anyone from Northern Ireland can identify as Irish, British or both,” she said. 2) Its as dead as Hector. Bringing in Bill Clinton and various shades of dubious people to get it through. them how they were duped over this so called `Agreement`. Not that anyone with half a wit can see through both-and have done from the word go. Terrorist leaders-no way was that a chance for a healthy society. So -this is where we are-this is what you have-this is what apparently you voted for. so for 2 years now. heaven alone knows what-at our expense. history-hopefully without a mention in the history books! entirely on the scrap heap. Great post as usual. The voice of reason as usual. One indisputable consequence of that agreement was that it created a mechanism which ended the conflict,... but arguably, breaksit may be creating a mechanism which might cause a resumption of the conflict. In any case, regardless of what anybody thinks about it, that agreement is part of U.K. law and applies very specifically to legal and political situations in Ulster,... and to people who were born in Ulster, and it can't legally be either ignored or misinterpreted,... by anyone,... including the British government.